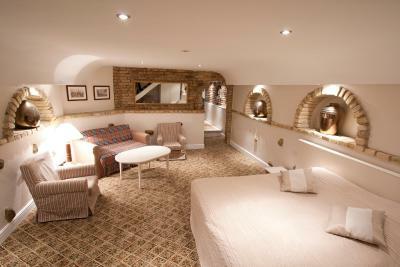 Lock in a great price for Real House B&B – rated 8.9 by recent guests! I’m staying In this property for the 3rd time and cans get better comfort for price around this area. The room was right across from the check-in and on the street. It was very cozy - large enough for two people to roam around with our winter photography gear and laptop and accessories strewn about. The staff at the check-in spoke English, which is always helpful on an international trip. Additionally, we had to leave prior to business hours the final morning to catch a flight, and they were able to accommodate our checkout and return of the key. 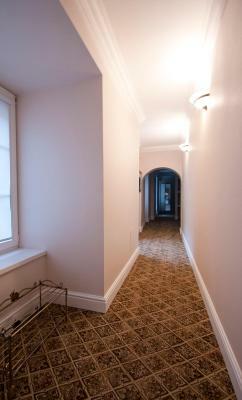 The location is great - within walking distance of plenty of sites and restaurants. 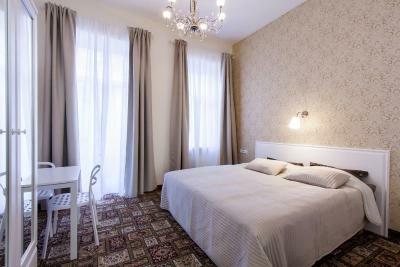 Cozy and nice accommodation, pretty close to city center. Clean, warm and the blinds are a real plus for a good sleep. Nice & quiet area, felt safe during the entire stay despite being on the ground floor. Good internet connection, I also appreciated having English TV channels such as CNN and BBC. Tea and instant coffee available in the room. You can leave your luggage at reception after checking out - quite helpful staff. 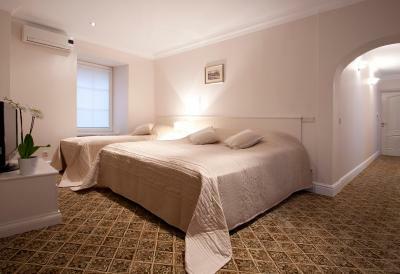 Very good location, room was big enough, in the price there was a breakfast included, brought to the room. Very friendly reception. 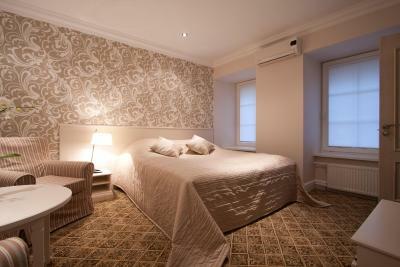 One of our favorite hotels in Vilnius. 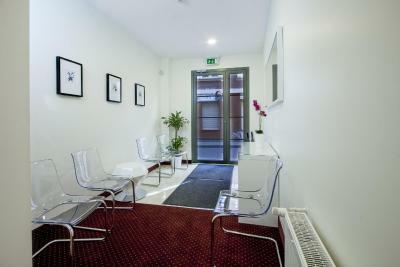 Perfect location in 5 minutes’ walk from the City Hall and 10 minutes’ walk from the railway station. Nice, king size bed, plenty of room to move. All the necessary things were there. Everything was clean. 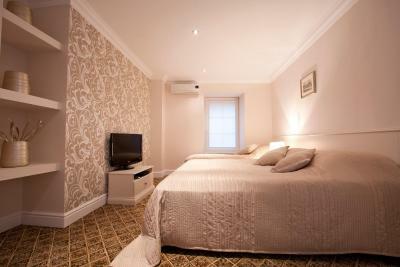 Great location, lovely breakfast, clean and comfortable accommodation. 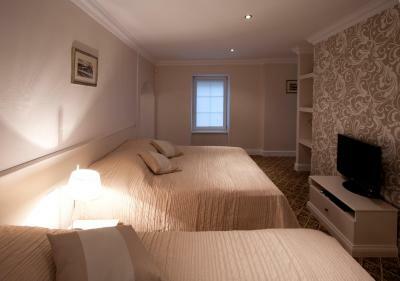 The windows had shutters on which made the room very dark therefore had a great nights sleep. The location was great and the staff was nice and attentive and have great advice. The room was spacious and comfortable. Super friendly staff, excellent breakfast, awesome value! 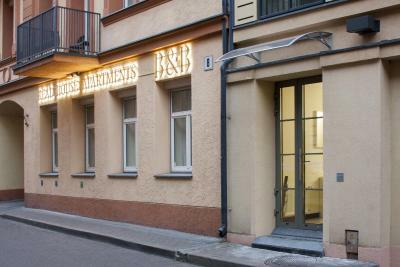 One of our top picks in Vilnius.Real House B&B is located in the heart of Vilnius Old Town and offer elegant accommodations with free Wi-Fi and LCD TVs. The historic Town Hall is only 1,150 feet away. 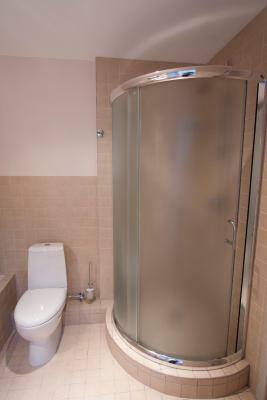 All apartments at Real House B&B are air-conditioned and equipped with modern bathrooms. 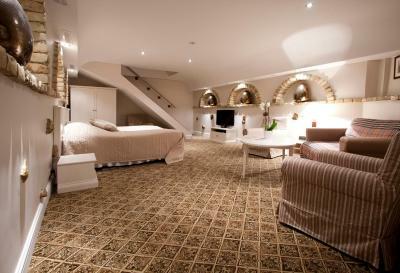 The living rooms done in white and beige, feature striped armchairs and patterned, tiled floors. 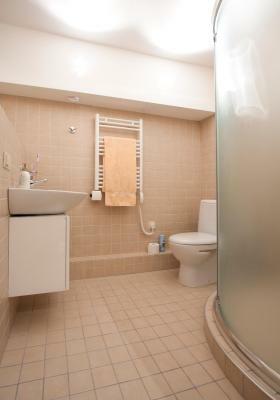 The apartments located on the ground floor have Venetian blinds for the guests’ security. 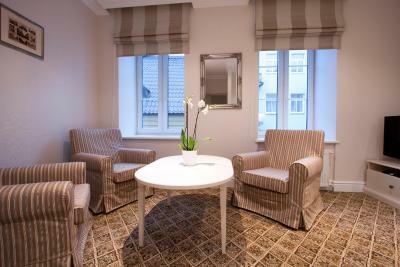 The location of Real House B&B guarantees an easy access to the center of Vilnius, with its cafés, nightclubs and sightseeing attractions. The Rimi food market is only a 7-minute walk away. 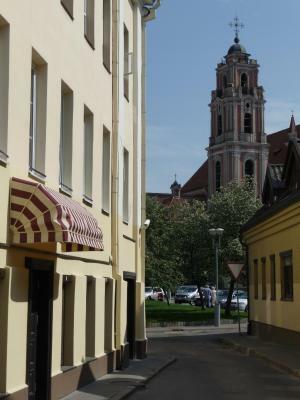 The nearest bus stop is 1,150 feet away from the apartments and the Vilnius Train Station is within 2,800 feet. 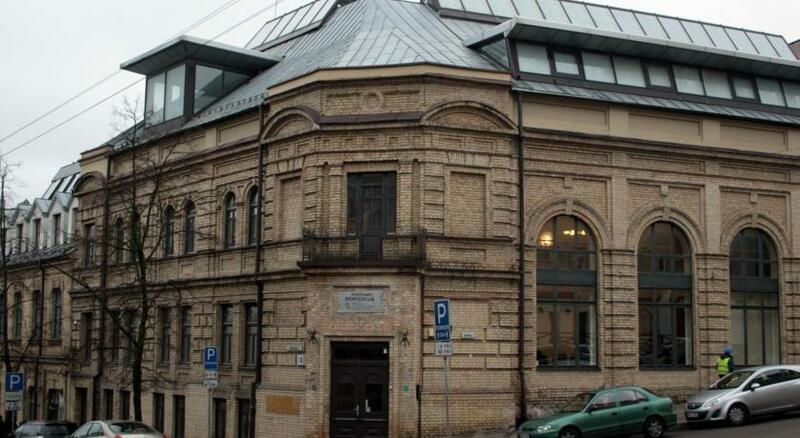 The Vilnius International Airport is a 7-minute drive away. 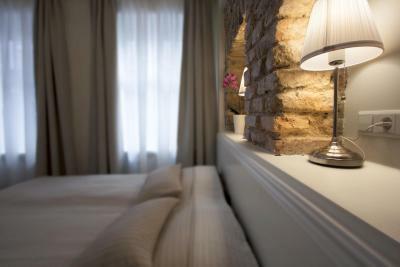 When would you like to stay at Real House B&B? 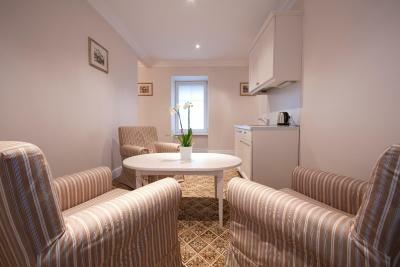 Spacious apartment with a bright, elegant living room combined with a kitchenette. 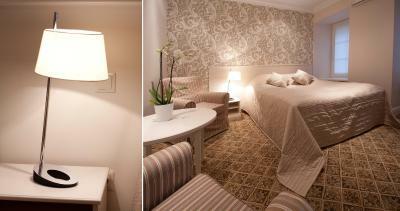 Features white furniture, carpeted floors and an LCD TV. It is located on the ground floor, so the windows are equipped with Venetian blinds. 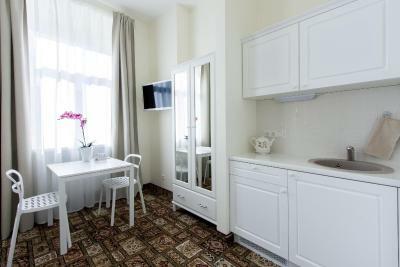 Apartment with a bright, elegant living room combined with a kitchenette. 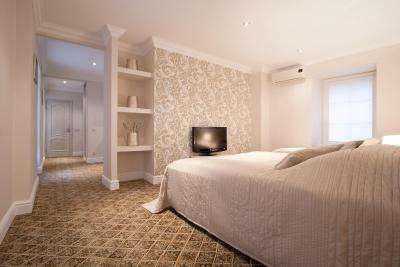 Features white furniture, carpeted floors and an LCD TV. It is located on the ground floor, so the windows are equipped with Venetian blinds. 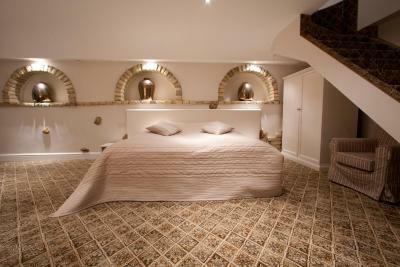 There is no possibility to add an extra bed in this room. 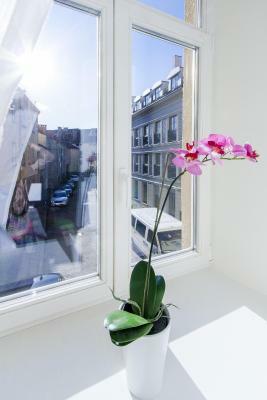 Spacious apartment with a bright, elegant living room combined with a kitchenette. 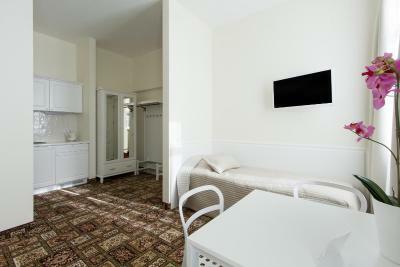 Features white furniture, carpeted floors and an LCD TV. It is located on the ground floor, so the windows are equipped with Venetian blinds. 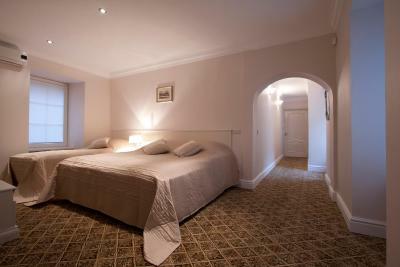 Please note an extra bed cannot be added in this room type. 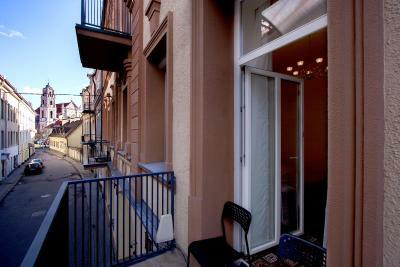 Bright, spacious apartment with a view of the courtyard and a street leading to the Old Town. 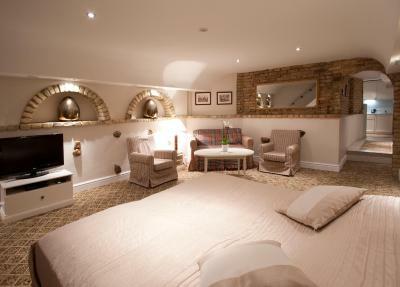 Guests can relax in an elegant living room with a seating area and an LCD TV. 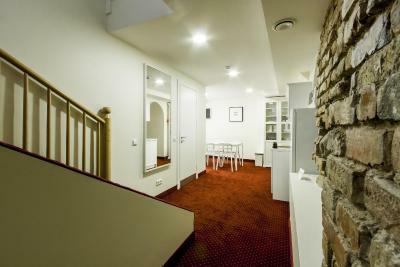 Designed in an Old Vilnius style with bare brick walls, the apartment is located underground. The living room includes a seating area and an LCD TV. This double room features a kitchenette with a dishwasher and kitchenware. It is located in the basement with no windows. 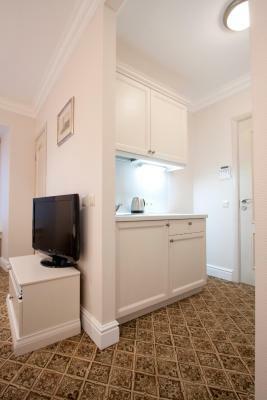 This double room features a balcony, kitchenware and microwave. 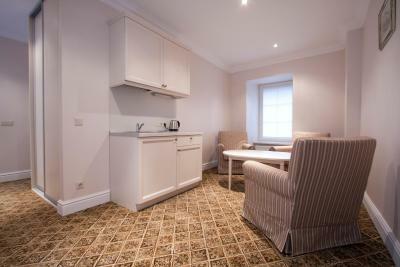 Located in the basement, this quadruple room has a microwave and a seating area. Please note that there are no windows in this room type. This apartment has an equipped kitchen. 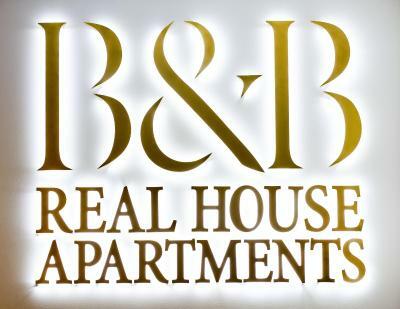 Real House B&B is not only about bed and breakfast . It is about the guest, who's comfort we value the most. That is why, we have a reception, which works every day, that would help to adress the questions or issues that the guest may have. 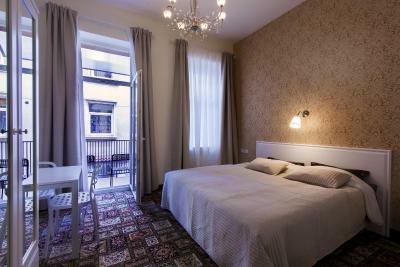 The accomadation itself has many different room types (from rooms with shared bathrooms to family suites) because we try to match to the different needs of our guests :) Real House B&B is located in a quiet street, but all the city areas including shops, cafes and other entertaiment areas are located within few minutes on foot. 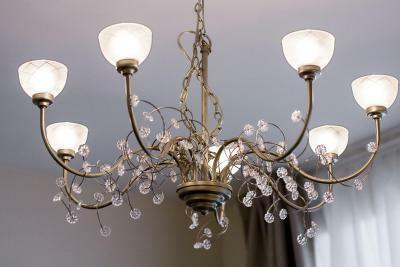 House Rules Real House B&B takes special requests – add in the next step! Real House B&amp;B accepts these cards and reserves the right to temporarily hold an amount prior to arrival. Real House B&B accepts these cards and reserves the right to temporarily hold an amount prior to arrival. 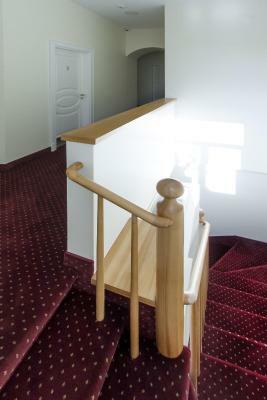 Late arrivals are available upon request and needs to be approved by the property. It was a little noisy at times but it was only for a short while. I would’ve preferred to be even closer to central although attractions were not far. Staff was very good and helpful. Tiles on the ground in the shower cabin look old. They should be changed. 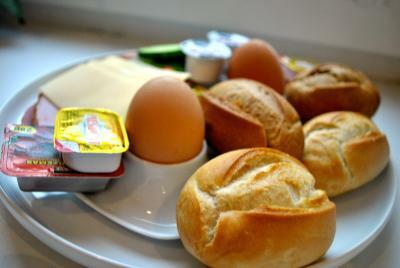 Breakfast that is really satisfying is served into your room, which is very nice. Receptionist is very helpful. The kitchenette has no sink!!!! It is weird to use the sink in the bathroom for kitchen. I asked for 2 single beds, but there were 2 beds connected and 1 sheet fir 2 beds. Nice location, clean, comfortable bed. Great location. Clean and stylish rooms. Good service. Super available prices. That was very good whole way true!!!! Clean, quiet hotel, helpful and polite staff. Located in old city, nice to walk around, enough restaurants and pubs around. 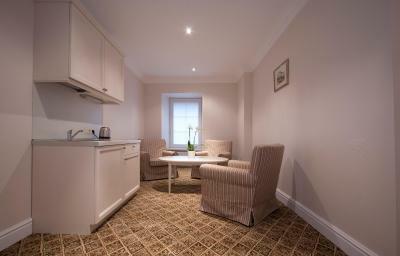 10 minutes by car from business centres on the right bank. Tasty breakfast served in the room. Recommended. The room was large, and the location was fantastic. 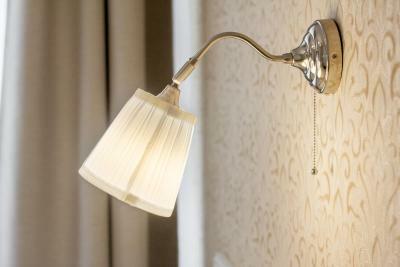 When booking be careful with equipment in the room (shower, windows). 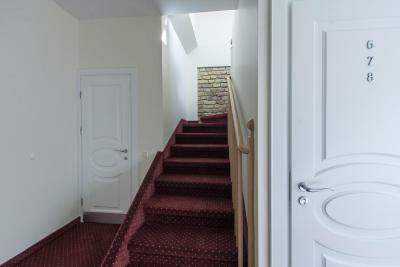 Hotel is in very good location, quiet, nice house with different rooms. 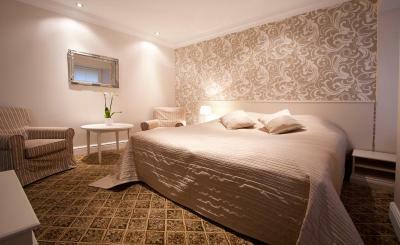 Rooms are newly renovated and decorated with good taste, specially I liked bed and bedclothes. I had everything what needed and staff were very helpful also. 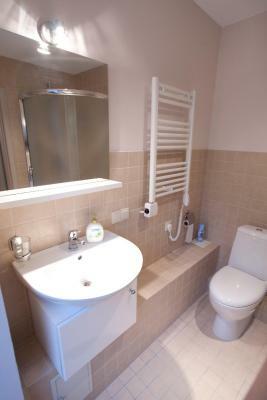 Convenient location, very comfortable, with mini kitchen (tea & coffee available) and clean bathroom. Helpful staff. Superb location. Parking on premisses.